Are you ready to sneak in one more vacation or weekend away before school gets started again in West Little Rock? If so, you’re probably wondering how to make sure your animals are well cared for. Here are some ideas from your West Little Rock vet on arranging great pet care! If you’re fortunate, you have a friend that can house-sit for you and keep your animals’ routines the same as if you were home. However, much of the time families are looking for other options. Some breeds of dogs and cats are much more focused on routine than others. No matter what breed you have, you may just have a pet who struggles when things change in a big way. 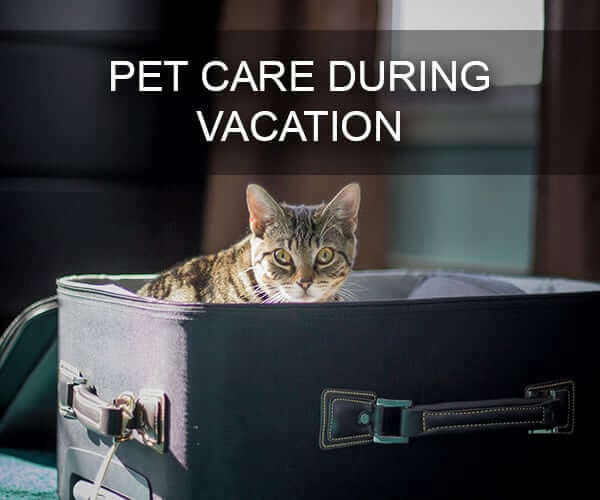 If you’re facing this situation, it’s important to take additional steps to make sure your animals are comfortable while you’re away. Look into having a pet sitter, or arrange for a friend or neighbor to stop in and feed your pets at the times they are already used to. Anything you can do to keep the situation “normal” will prevent problems. You don’t want your pet destroying something in your home and needing to visit a West Little Rock vet while you’re gone! No matter how independent your pets are, you don’t want to just put out extra food and hope for the best. Animals who are alone can cause damage to your home and may also get injured. Before you leave, make sure that your pet’s ID tags are up-to-date, in case they get out. Ensure that the person caring for them has detailed care instructions, including tidbits on favorite toys and activities. Finally, make sure that your caretaker has the number for your West Little Rock vet while you’re gone. Whether your pet gets sick, eats something they shouldn’t, or is injured, you want to ensure they get proper care. If you don’t have anyone who can watch your pets or stop into your home, you can consider boarding the animals at a West Little Rock vet like Bowman Road Animal Clinic. We are committed to helping your furry family members feel at home while you’re enjoying your trip. You can have peace of mind knowing that they are in excellent care. Make sure the boarding you choose is fully equipped with heating and air conditioning systems to keep your pet comfortable. Check to make sure the boarding rooms are spacious so that your pet doesn’t feel caged. Finally, make sure they will receive friendly and professional care around the clock, not just 9-5. When you find high-quality boarding you can know that your pets are having almost as much fun as you are! Having a doctor you’re comfortable with, who has the right tools, training, and equipment, is vital when you’re talking about your kids or loved ones. It’s no different with your pets. We know that your pets are part of your family, and as pet owners ourselves we are proud to provide top-level care at our West Little Rock vet clinic. Need boarding or other attention for your pets? Contact us for an appointment today!